The Quality Management System at Tygavac Advanced Materials Ltd is based on the requirements of BS EN9100 & ISO to 9001:2015 & 9100:2016 management system standards. Our primary objective is to achieve “Customer Satisfaction Through Excellence” and to supply products and services in accordance with the negotiated requirements of our customers. At Tygavac we maintain a process for continual improvement and measurement against defined objectives this is achieved through constant analysis of process, product, personal performance management and customer information resulting in the setting of realistic, measurable targets and objectives which enable us to provide the right product at the right price and at the right time. Tygavac Advanced Materials Ltd takes seriously it’s responsibility is respect of the Environment and has implemented an Environmental Management System in accordance with the requirements of ISO14001. Our primary objectives include, the management of all wastes in accordance with the ‘Waste Hierarchy’ i.e. Prevent, Re-use, Recycle minimising our carbon footprint and ensuring compliance with local, national and international regulations relevant to sound environmental practices. 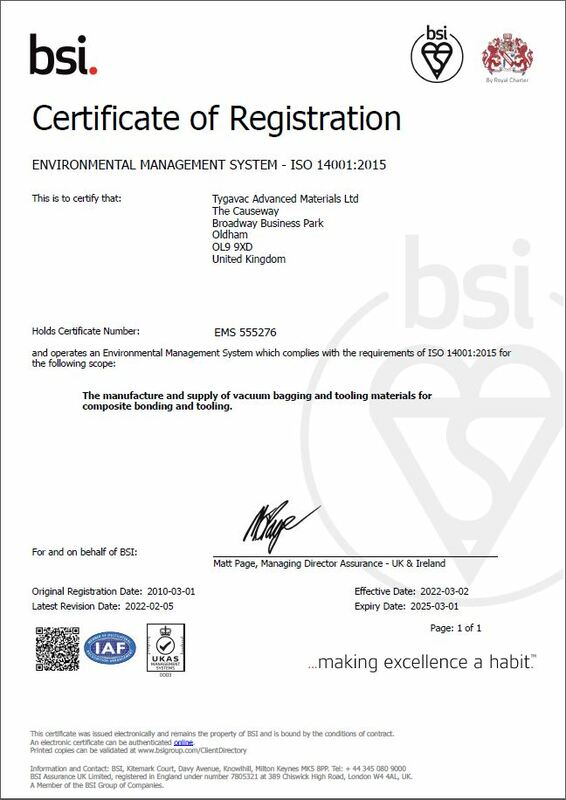 Both management systems are monitored and accredited by internationally recognised accreditation bodies.